Providence Health & Services is holding its 36th annual festival of trees. What: Experience the magic of the holidays through the eyes of a child at the 36th annual Providence Festival of Trees in Portland. Children experience the holidays with an innocence and joy that brings warmth to this special time of year. Caring for children and helping them reach their utmost potential is always the goal of Providence Children’s Health and the focus of this year’s festival. Providence hospitals deliver nearly 11,000 babies in Oregon every year, more than any other health system. That’s why the theme of this year’s festival is “Start Strong”. Giving babies a strong start includes ground-breaking research like delayed umbilical cord clamping – a study our newborn research team is doing to boost babies’ brain development. Funds raised will help Providence Beginnings – a program for underserved and at-risk pregnant women. Proceeds will also help clinical teams in rural communities get help with high-risk deliveries through Providence telemedicine. Attendees at the 2018 Providence Festival of Trees will be able to support these essential programs while experiencing the magic of the season. People of all ages will be dazzled by the elaborately decorated Christmas trees, wreaths and holiday displays at the festival. Children will delight in the dozens of activities including a visit with Santa, caroling, crafts, cookie decorating and pajama party movie night! Public show admission: $8 for adults, $7 for seniors, and $6 for children ages 3-12. Children 2 and under admitted free with an adult. Tickets available for purchase online. Costs increase $2 at box office. Visit www.ProvidenceFestivalofTrees.org/portland for more information, a discount coupon and to purchase tickets. Details: Portland begins its annual celebration of the holidays with one of its premier community events – Providence Festival of Trees. 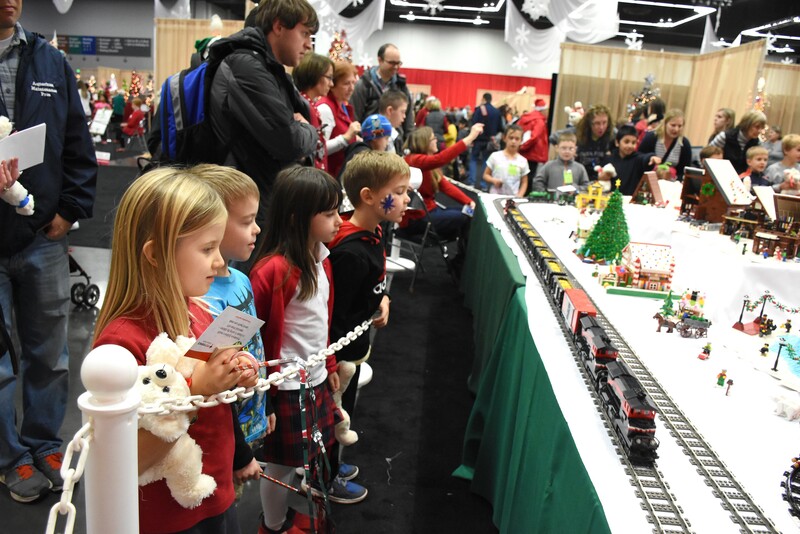 This is a year-long, volunteer-driven project with nearly 75 professional and amateur designers volunteering thousands of hours to turn a corner of the Oregon Convention Center into a winter wonderland and holiday village. Nearly 20,000 people are expected to experience the 2018 festive gathering with 75 trees of all sizes decorated with 100,000 twinkling lights. More than 600,000 people have attended the festival since it began in 1983. Tree # 8: The Force is Strong with this One This is a Star Wars fanatic’s dream tree featuring unique collectibles that even the most critical Jedi will appreciate. The tree features a custom Death Star tree topper that can later be used as a lamp, a Star Wars Millennium Falcon LEGO set and a gift certificate for a custom lightsaber. Bring a galaxy far, far away right into your home! Tree # 10: Tree-Ranosaurus Rex Tree-Ranosaurus Rex is sure to add a festive roar to your Christmas décor! This handcrafted, pre-historic creature is designed using more than 10,000 hand painted thumb tacks. Plus, the paper mache dinosaur eggs will crack to reveal a reptile toy surprise. Any budding paleontologist will surely find this tree dino-mite. Tree # 18: It’s a Wine-derful Time of the Year Inspired by some of the best wine cellars in the Pacific Northwest, this instant wine library will make your friends think you are a sommelier. With more than 100 bottles of vino from Oregon’s finest wineries, you’ll have enough wine to keep, give and serve at your festive gatherings. The wine-derful tree also includes an Oakcraft solid wood bookcase to fill up with books or bottles. Tree # 22: Christmas Cat... in the Hat! The Cat in the Hat and other books by Dr. Seuss have been inspiring new readers for more than 50 years. Give the gift of a book now and the love of reading for a lifetime. This imagination-fueled design comes with hundreds of Dr. Seuss books, a plush Cat in the Hat, ornaments even the Grinch would love and a special feline treat of two cat adoptions from the Oregon Humane Society. Tree # 25: A Charlie Brown Christmas Inspired by the iconic scene from “A Charlie Brown Christmas”, where the Peanuts gang works together to put on a Christmas play, this tree will bring back many childhood memories. But unlike Charlie Brown’s sparse and sad little Christmas tree, this dazzling tree is overflowing with surprises – including a signed, Charles M. Schultz photograph, eight hard-bound volumes of Peanuts cartoons, plush Peanuts character dolls and a child-size stage perfect for pretending. Family movie night, 6 p.m., Friday Nov. 30 – Put on your PJs and enjoy animated films “Prep and Landing” and “Prep and Landing 2” – stories about one of Santa’s hard-working elves who rediscovers his Christmas spirit. Popcorn and holiday goodies will be served. Tree Raffle – Would you love to have one of this year’s Festival trees in your home for the holidays? Buy a raffle ticket for your chance to make your holiday unforgettable. New this year: Starting Strong Photo Booth – Are you ready to perform magical feats of strength? You can at our interactive photo booth and personal experience timeline. Even the youngest members of your family will be able to lift a huge, but ultra-lightweight barbell over their heads for impressive photos. Visitors can also share tips about parenting and pregnancy by placing stickers on our advice wall. Visit Wrangler’s house – Wrangler is a facility dog who comforts and calms children in the Children’s ER at Providence St. Vincent. His dog house includes interactive activities for kids and lots of opportunities for photos. Teddy Bear Hospital – Children 12 and under can bring in their teddy bears (or get one at the festival) and learn all about health and hospital care in a fun, interactive space with Providence doctors, nurses and caregivers. Their journey through the ambulance, emergency room and operating room helps build confidence and calm fears. User Group Train Display – Don't miss the LEGO and train display designed by PortLUG, or Portland LEGO User Group. The display will feature familiar scenes of Portland, including Providence Park, food carts, a farmers market and the Max train. In addition, holiday-themed scenes will be hidden in the display, such as a Christmas tree farm and Santa delivering presents via medical helicopter to a hospital. Photos with Santa – Be sure the little ones get to spend a few minutes with the Jolly Old Elf. They can whisper their wishes to him as a professional photographer captures the special moment. Photos with Santa are available for $10. Personal cameras are also welcome. Santa's Workshop – The big guy could use a few more elves in “Santa’s Workshop.” Stop by and make a special gift for a loved one. This hands-on feature of the festival offers a variety of activities and crafts to match the skills of all elves. Mrs. Claus’ Kitchen – This year, Mrs. Claus will open her kitchen to offer holiday cookie decorating tips. Learn how to create festive holiday treats and sample the finished products! Providence Festival of Trees is presented by Safeway. This sponsor support makes it possible to provide financial assistance for Providence Health & Services programs. Over the last 35 years, Providence Festival of Trees has raised more than $17 million, which benefits Providence programs and services caring for the most vulnerable in the Portland community. This year’s event seeks to raise more than $1.5 million, which will support Providence Children’s Health programs including telemedicine, Providence Beginnings and newborn research – all of which help Oregon babies start strong. For more information about the 2018 Providence Festival of Trees, please go to www.providence.org/festivaloftrees. [email protected] 503-216-7138.